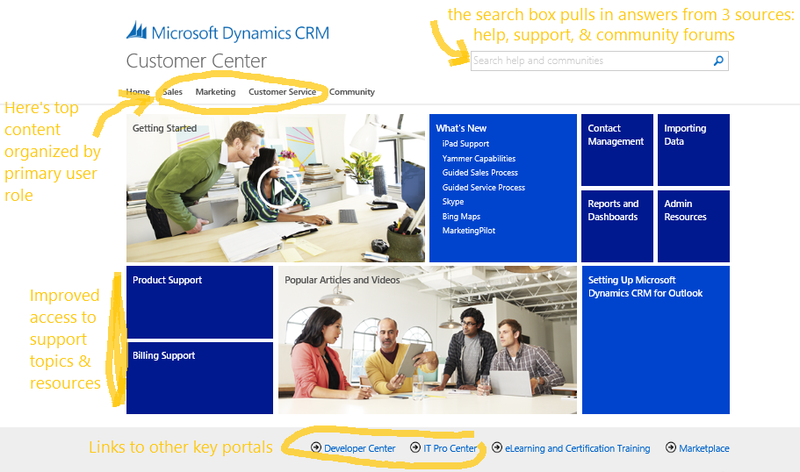 I manage the Dynamics CRM Resource Center (recently renamed the Customer Center), and I’ve noticed some questions about how users should get to the site and access help from within the CRM application. While the product’s site map no longer includes a direct link to the Customer Center, there are still two easy ways to get to the valuable content that the site provides. When you get to the appropriate Help topic, in the upper left-hand corner of the page there is a ‘CRM Customer Center Home’ link that always takes you to the homepage. Here you can find answers by using Search — which helpfully pulls in information from a variety of great sources (Help, Communities, and Support sites) — or you can browse topics and videos that are categorized either by subject category or by role. We’re constantly working to improve the site and the content that it provides based on feedback from our users, so please let us know if you have suggestions or questions. We have some great ideas in store – so let us know what you think, what’s working and what we can do better. Just click the Customer Center Site Feedback link at the bottom of any page in the Customer Center. We’re listening!